Responding to PM Narendra Modi’s call, netizens gave thumbs up to the ‘Main Bhi Chowkidar’ movement. 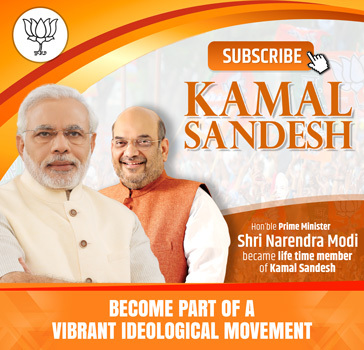 On March 16, 2019 soon after the Prime Minister Shri Narendra Modi urged the people to take the ‘Main Bhi Chowkidar’ pledge, the movement saw participation of people in lakhs of numbers. #MainBhiChowkidar became the top worldwide trend on Twitter on that day. A day after the launch of ‘Mai Bhi Chowkidar’ campaign on social media, Prime Minister Shri Narendra Modi changed his username from Narendra Modi to ‘Chowkidar Narendra Modi’. BJP National President Shri Amit Shah also followed the Prime Minister to rename his Twitter handle to “Chowkidar Amit Shah”. Minutes after PM Shri Modi and Shri Amit Shah changed their names on Twitter, all BJP leaders, Union Mnisters, Chief Ministers, Karyakartas and lakhs of common people also added “Chowkidar” worldwide to their Twitter account names. Launching the movement PM Shri Narendra Modi wrote on his twitter account, “Have you taken the #MainBhiChowkidar pledge? Your Chowkidar is standing firm and serving the nation. But, I am not alone. Everyone who is fighting corruption, dirt, social evils is a Chowkidar. Everyone working hard for the progress of India is a Chowkidar. Today, every Indian is saying-#MainBhiChowkidar”. PM Shri Narendra Modi used the word ‘Chowkidar’ after he became Prime Minister in 2014. He has repeated these words in public rallies and even on Social Media to send a message that he was a servant of the people rather than an authority figure in the country what was the perception earlier. “The one who made cleanliness a moral value… he is called Chowkidar #MainBhiChowkidar. Say with all your heart #ChowkidarPhirSe,” BJP National President Shri Amit Shah tweeted after changing his Twitter name. 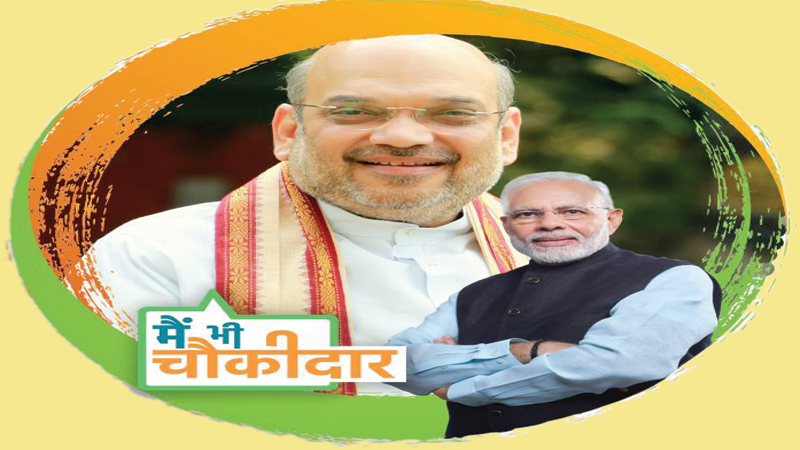 BJP in a statement said that ‘Mai Bhi Chowkidar’ campaign has been started after extensive surveys and data analysis by BJP strategists who feel that Congress’s jibes and campaign are not resonating among the people. “Surveys suggest that Congress’s jibes and campaigns are actually angering people,” BJP said. PM Shri Modi will interact with people from across the country on March 31 as part of this campaign, the BJP said. The ‘Main Bhi Chowkidar’ module has been launched on the ‘Narendra Modi Mobile App’ where people can upload their pictures along with the Prime Minister’s picture and take the pledge. Thousands of people showed their support by taking the pledge on the NaMo app and shared it on social media. People across the country are taking pledge to become ‘chowkidar’ as it is becoming synonymous with patriotism and honesty, Prime Minister Shri Narendra Modi said on 21 March, 2019 while interacting with 25 lakh watchmen as part of a new campaign. Addressing around 25 lakh security guards via an audio bridge, Prime Minister Shri Narendra Modi said some people were running a disinformation campaign against ‘chowkidars’ for their vested interests, an apparent reference to Congress’ “chowkidar chor hai” slogan. As part of BJP’s “Main Bhi Chowkidar” campaign, Shri Modi, during the interaction, said that calling a ‘chowkidar’ chor repeatedly was an insult to all chowkidars. He said, “You must have noticed that these days everywhere it is you who is being discussed, be it TV or social media, be it in India or abroad. Everyone is talking about chowkidar. The entire nation is taking a pledge to be a chowkidar today…Calling a chowkidar chor repeatedly is an insult to all chowkidars,” . Happy to join the #MainBhiChowkidar movement. Shall undertake every effort for building a #NewIndia free of corruption. Shall work to reach out to all sections of our society to keep India safe. “As chowkidars of our nation, we are committed to creating a clean economy by using cashless financial transactions. The menace of corruption and black money has adversely affected us for decades. Time to eliminate these for a better future.#MainBhiChowkidar #ChowkidarPhirSe”. “As Chowkidars (watchmen) of our nation, we are committed towards safety and security of our people and their wealth. Elimination of middlemen and cleaning of economy has rattled all corrupts in every part of the country and today every thief is afraid of Chowkidar”. “In comparison to 2013, mangrove cover increased by 293 sq km during the tenure of Narendra Modiji-led government. While 18 effluent treatment plants were set up to reduce river pollution, 44 real time water quality monitoring stations were set up on Ganga and its tributaries” #MainBhiChowkidar.